Give me ALL the pumpkin! Last week I shared my new favorite pumpkin cookies, did you see them. They are CHEWY (not cakey). Picture your favorite chocolate chip cookie that’s crisp on the outside and soft on the inside–and then add pumpkin spice flavors to it. YUMMMMM. Keeping with my pumpkin obsession, I have been so excited to give this recipe an update for you all. I originally shared this recipe in 2014, and the pictures were in desperate need of an update. It still remains one of my favorite pumpkin desserts. 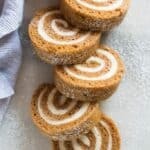 You just can’t beat a classic pumpkin roll recipe, and this one has a trick for making the process easier then ever. 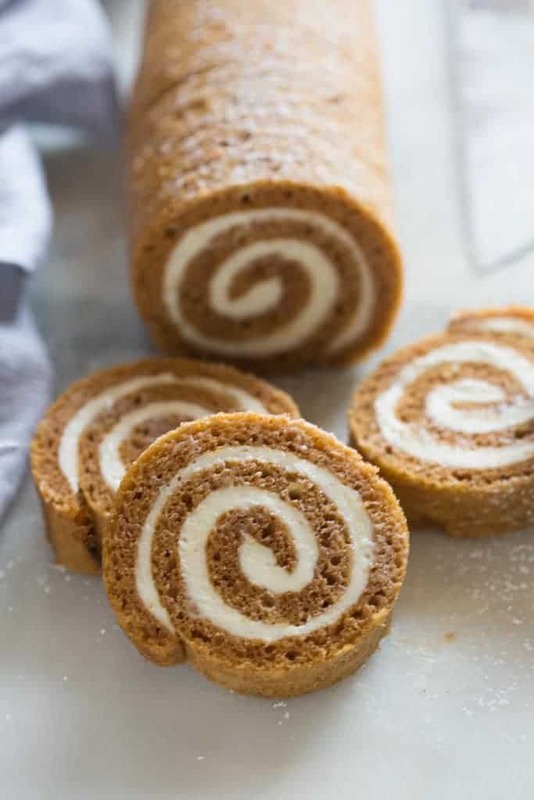 I know many people avoid making pumpkin rolls because the process seems tricky. This method, however, is easy and completely fool-proof! Most recipes have you invert the baked cake onto a large towel that has been dusted with powdered sugar. Then you’re supposed to roll the cake up in the towel. Honestly, this method has always been a dusty, powdered-sugary MESS for me. Not to mention that you end up with a sticky mess of a rag when it’s done. Guys, there is such a BETTER and EASIER way! Parchment paper is the trick! 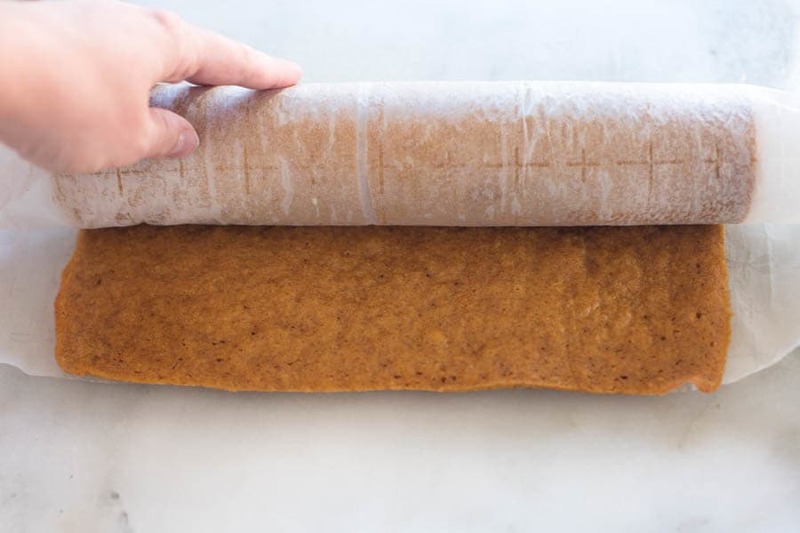 The biggest tip to making an easy, mess-free pumpkin roll is to roll the pumpkin cake up inside the parchment paper that it was baked on. Allow it to cool. Then unroll it and spread with cream cheese frosting. 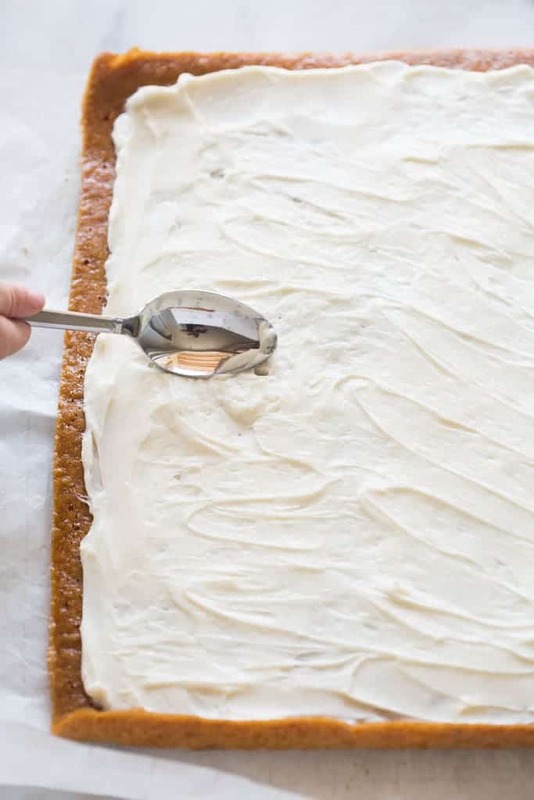 First, line the bottom of the pan with parchment paper, leaving a little overhang on the long edges, so that it’s easier to lift the cake from the pan when it’s done baking. 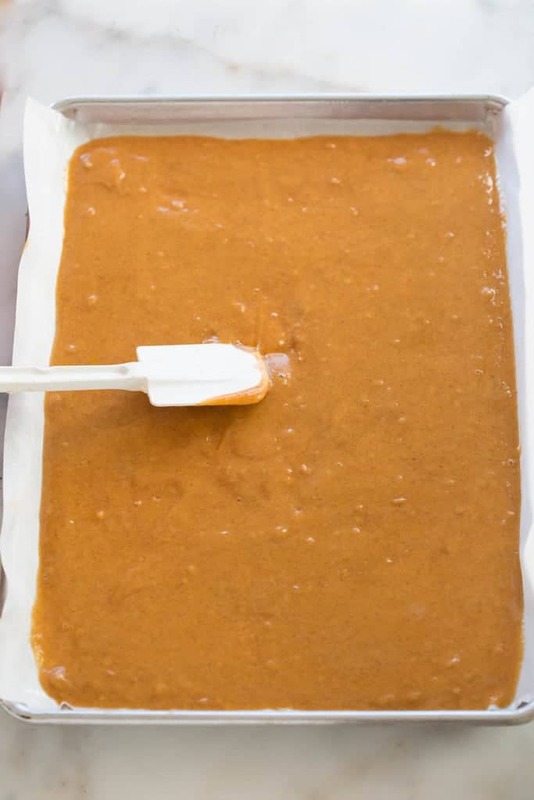 Then spread the cake batter on top of the parchment paper in the jelly roll pan and smooth it into an even layer. Bake it for about 15 minutes. When the cake is finished baking, carefully lift the cake from the pan and roll the hot cake up inside the parchment paper. This method is SOO much easier then turning it out onto a towel and praying that it doesn’t crack, or stick to the towel. Allow the cake to cool completely, rolled up in the parchment paper, on top of a wire cooling rack. Once it’s cool unroll the pumpkin roll and discrad the parchment paper. Spread the cream cheese filling all over the top of the pumpkin foll and roll it back up into a log (without the parchment paper). Does the pumpkin roll need to be refrigerated? YES! 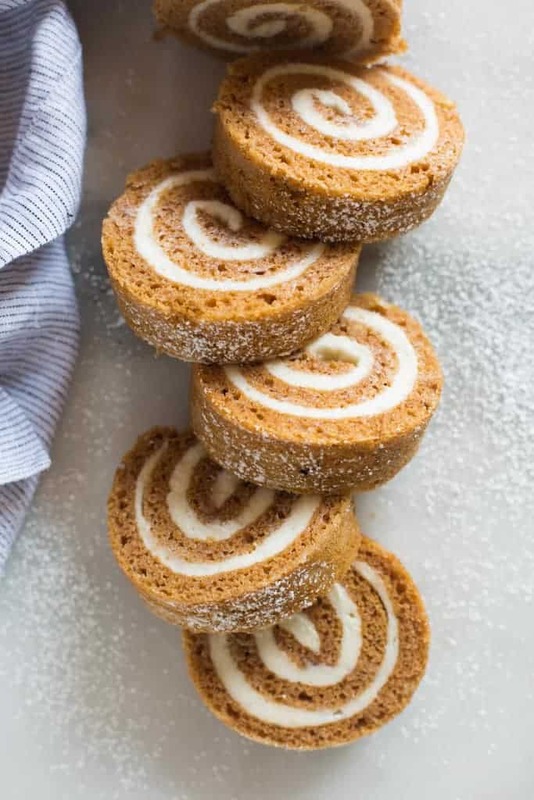 Once you have rolled spread the cream cheese filling and rolled the pumpkin roll back into a log, wrap it in plastic wrap and leave it in the refrigerator for at least 1 hour before serving! This cake roll can be prepared completely and refrigerated for 1-2 days before serving. OR, you can bake the cake, roll it in the parchment paper to cool. Once cool, refrigerate it (rolled in the parchment paper) for up to 1 day, before frosting. Once you have fully assembled your pumpkin roll, you can also store it in the refrigerator for a few days! 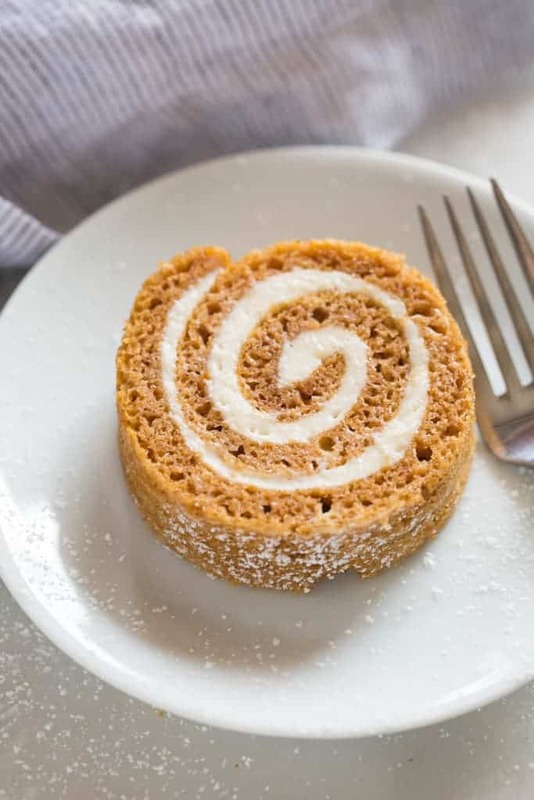 Yes, you can freeze a pumpkin roll! Freeze your pumpkin roll by first preparing the cake roll completely, with the frosting. Freeze it for up to 2-3 months. Thaw overnight in the refrigerator before slicing and serving. For more pumpkin treats, click here! Instructions for making ahead and freezing are listed above in the post. Hello Lauren, thank you so much for this recipe and your specific directions. In all my 54 years of baking, I have never attempted a jelly roll! Then I saw your post on Pinterest and thought….”Here goes. If it cracks badly, I won’t serve it to company.” I popped it in the oven and I had dangerous thought that that was quick easy, but we’ll see when it comes to the roll up and re-roll. Lauren, you Sweetheart, I aced it thanks to you. And bonus, no messy towel! Spray pan with cooking spray a tiny bit. I’ve always made mine with wax paper. And I dust a tea towel and flip it out of the pan onto powdered sugar remove wax paper then roll. Sometimes it blows powdered sugar everywhere but baking is sometimes messy lol. Cool unroll proceed with filling. Hope this helps. Love this recipe. Quick and easy, too. I am so happy to hear that you have had success with the recipe. I love it as well :). I had the same feelings about wanting to create a different version so I created a chocolate peppermint cake roll. That is one you may enjoy!